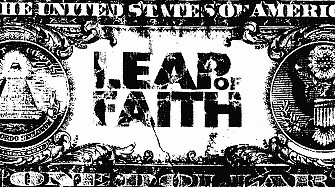 Leap of Faith: Selling Miracles on 44th St. The show opened Thursday at the St. James Theater on West 44th St. But in the last week of previews, the company of "Leap of Faith" was glowing backstage. And not just because of Raúl Esparza's disco preacher jacket. They all felt what was palpable from the audience; this movie remake will live long despite critical cynicism; its gratifying storyline, paired with a score from Tony and Academy Award-winning composer Alan Menken, make for a magnetic if predictable Broadway musical. But what musical isn't predictable? Is it the job of a musical to double as parable or tragedy or thriller? Like Steve Martin in writer Janus Cercone's 1992 film, Esparza plays Jonas Nightingale, the crooked, hard-drinking preacher with a fitful conscience. The show starts as a revival, the company dressed in Gospel robes acting as ushers, and launches into a knee-slapping Gospel number, "Rise-Up," before taking a handful of country interludes, like "Fox in the Henhouse" and "I Can Read You," placing the production firmly in the musical's small town Kansas locale. The revival atmosphere is evocative of other culture-creating favorites - a "Rocky Horror" for the churchgoing set. During previews, women in the front row wore their Sunday best: flamboyant hats, white gloves and blue blazers. Later, members of the choir - the Angels of Mercy - troll the crowd with collection baskets, patrons waving (fake) dollar bills. The bills fluttered in the air until the basket was thrust in their direction, freeing their hands to propel toward heaven at the behest of Preacher Nightingale, the audience deaf to the cabs on the slick streets on the other side of the wall. They were in Kansas until 10:35. Esparza, the Susan Lucci of Broadway stars (four Tony noms, no wins), warms up as "Leap" unfolds, his performance culminating in "Jonas' Soliloquy," a solo number that has him walking alone in a cornfield, calling out to God. Leslie Odom, Jr. (NBC's "Smash") also shines as Jonas' morally superior successor, Isaiah, choir-leader Ida Mae's son. As Ida Mae, Kecia Lewis Evans has a gigantic singing range with soulful affects that hint at a history with Gospel music. Backstage, Esparza gave all the credit to Menken and book-writers Cercone and Warren Leight ("Law and Order: SVU") before retiring to his dressing room to rest his instrument. Stacks of the "Leap of Faith" bills sat on prop shelves as stagehands cleaned and dried the stage. Actors from the audience were ushered in from stage left to meet the cast, all singing praise like the choir before. Menken smiled. He'd been pulling the show along for nearly a decade, he said. Now, he was there. Review: Banksy's "Exit Through the Gift Shop"
Review: "A View From the Bridge"
© 2014 YBNY, LLC. All Rights Reserved.